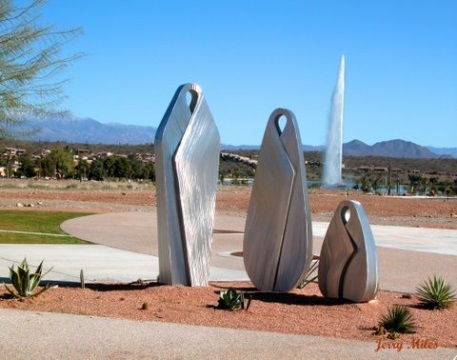 Fountain Hills has an impressive collection of public art for a community of any size! Come learn about more about the artist and history of each piece as the Town of Fountain Hills hosts docent-led art walks to explore the sculpture pieces as well as the “flat” pieces donated by citizens throughout the community. Take advantage of these fun tours as they wrap up the season…the next tour is Wednesday, March 18th from 7:45 to 9:15 am. The volunteer docents will be providing information on the walks about each piece they visit, the techniques used to create the piece and a background on each artist that created the piece. The art walks are a cooperative effort between the Town of Fountain Hills, the Chamber of Commerce and the Public Art Committee of the Cultural and Civic Association. SIGN UP & TAKE A FREE TOUR! Saturday’s from 9:00 to 10:30 a.m.
Wednesday’s 7:45 to 9:15 a.m. This entry was posted in Area Events, Arts, Culture, Schools & Clubs and tagged Fountain HIlls Cultural and Civic Association, Town of Fountain Hills. Bookmark the permalink.